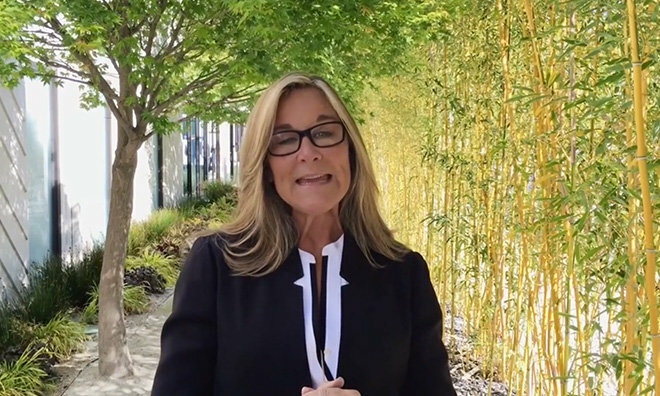 The video, obtained by Mac4Ever, shows Ahrendts addressing Apple Store employees from Cupertino in what appears to be an impromptu update necessitated by customer questions surrounding current and future availability of Apple's latest products. Both Apple Watch and the 12-inch MacBook launched on April 10 to overwhelming demand, but the company switched to an online-only method of ordering that apparently left many buyers confused. Ahrendts wants employees to impress upon customers that Apple Watch is not simply a new device, but an entirely new product and platform. As such, Apple tried out a new system by which customers were invited to try on various models at Apple Stores two weeks before actual availability. Instead of allowing early buyers to queue up at Apple Stores on launch day, as is common practice for iPhone and iPad, Apple chose to handle all preorders online. The first Apple Watch orders are expected to reach customers by Friday and Ahrendts told staff to be ready for personal setup appointments. Initial supply sold out within minutes and customers ordering now have to wait at least four to six weeks for delivery. Earlier today, Apple extended a limited time offer to developers, giving select individuals the opportunity to buy a 42mm Apple Watch Sport that will arrive by April 28. The retail chief acknowledges the Watch situation is "unique," saying future product launches will be handled directly at brick-and-mortar stores. She added that Apple's website is the best place to get information on new device features and rolling availability. As for MacBook, Ahrendts said the laptop's launch was one of the best ever for Apple. Especially popular are MacBook's new color options, Space Gray and gold, though all models are seeing high uptake. She makes special note of MacBook's single USB port, urging employees to review personal setup training material as data migration methods have been substantially changed. Ahrendts plans to send out weekly updates with availability information relating to both products.